Few experiences can match the fulfilment of helping someone learn to ride with confidence. Our Cycle Instructor Training will equip you with the skills required to deliver cycle training to children and adults from beginner level to advanced. We have collaborated with Welsh Awarding body Agored Cymru to create this fully-validated Level 3 Award in Cycle Instructing, which is the only cycling instructor qualification recognized by Qualifications Wales. 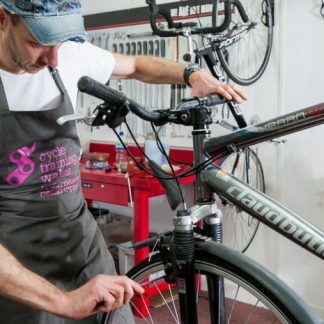 Cycling Theory: this will equip you with detailed knowledge of recognized cycle training standards, legal requirements for cyclists, and best practice guidelines. Risk Management: this covers all aspects of risk management for cycling instructors, including risk assessment, safeguarding, and basic maintenance. Delivery: this covers management, communication, and pedagogical skills required by cycling instructors in a range of contexts. 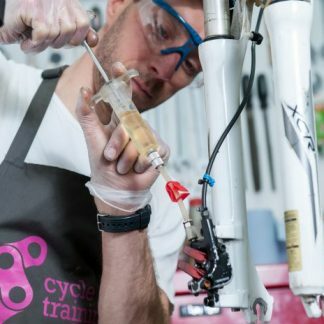 This course has been designed to correspond closely to all requirements of the UK National Standards for Cycle Training 2013, but will be broadly useful for cycle training following any similar framework. The course runs for four days, 0930–1630 each day. There are further tasks to be completed at home. In addition, following completion of the four-day course, candidates will be expected to produce a log book of training and be assessed by a trainer in order to achieve full certification. For further information, please contact Nick on nick@cycletrainingwales.org.uk or 07971 719626.